A few amazing Bath and Body products under various price points just so you can pamper yourself without breaking the bank! I am a huge sucker for shower gels, body scrubs and body care products in general and think these would make for some very beautiful gifts for just about anyone! 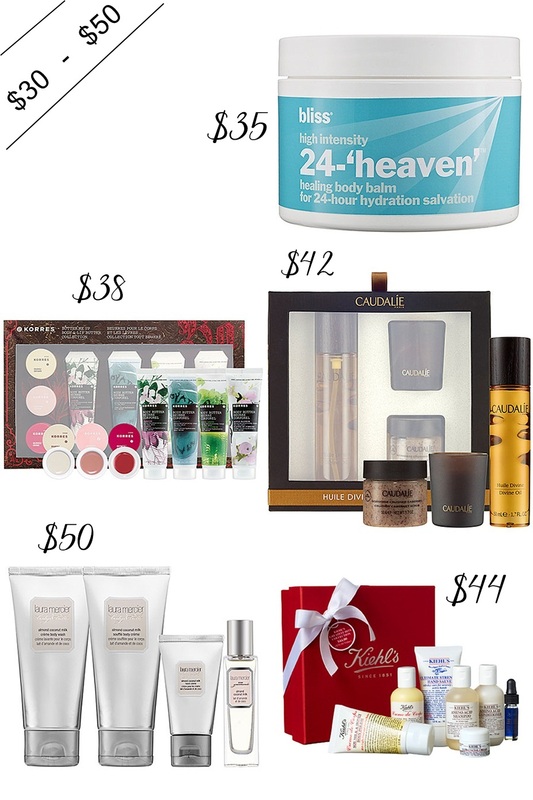 Little travel-friendly luxuries that you can throw into any gift basket or as stocking stuffers! Lavanila Healthy Deodorant in Lavender Vanilla - Travel Size - Love this deodorant so much! Made from all natural ingredients, it works just as effective as the regular deodorant sans the nasties. Caswell-Massey Sea Grass Hand & Body Soap with Sea Grass Wrap - With sparkling notes of crisp greens, calming florals and hints of Cedar and Sandalwood, this soap is a luxurious shower treat! The smell lingers around for a really long time. L'Occitane Shea Butter Hand Cream - Travel Size - Ultra rich hand cream with 20% shea butter! These handcreams are luxuriously scented and a great little thing to carry in your bag during winter. Korres Butter To Go Body & Lip Butter Duo - A great value set with two of Korres' favourite butters! Burt's Bees Tinted Lip Balm Duo - Nourishing tinted lip balm duo with an all natural ingredients list! AHAVA Dermud Intensive Foot Cream - Lighweight foot cream infused with dead sea minerals. It is quite pampering and leaves feet feeling silky smooth by morning. Laura Mercier Le Petite Patisserie Sampler Hand Crème Quartet - A four piece sampler kit featuring Laura Mercier's luxurious hand cremes. Suki Butter Cream Salve - An all purpose Salve made from 100% natural ingredients. Works on dry spots like elbows, knees and heels. Bliss Raspberry Champagne Body Butter - A new, limited-edition body butter by Bliss for the holidays, infused with the right mix of fruity and citrusy notes. Paraben-free! Burt’s Bees Favorites - Pomegranate- Kit comes with full sizes of the Cranberry & Pomegranate Sugar Scrub, Cranberry & Pomegranate Replenishing Body Bar, Replenishing Lip Balm with Pomegranate Oil, Naturally Nourishing Milk & Honey Body Lotion, Signature Spa Pouf! Kiehl's 'Giftables' Lip Balm Set - A collection of five of Kiehl's Lip Balms in Clear, Vanilla, Coconut and Mango! Bliss High Intensity 24–‘heaven’™ Healing Body Balm For 24–Hour Hydration Salvation - A healing body balm designed to cure extremely dry, irritated skin by exfoliating, replenishing, and protecting. It smells totally comforting too! Caudalie Divine Oil Set - One of the most luxurious body care kits out there. Contains Divine Oil, Crushed Cabernet Scrub and a candle for a complete spa experience at home. Korres Butter Me Up Body & Lip Butter Collection - A decadent collection of luxuriously scented Body Butters and plush Lip Butters to soften, moisturize, and rejuvenate the skin and lips formulated without parabens, sulfates and Pthalates. Laura Mercier Le Petit Patisserie Travel Quartet - Deluxe sizes of the Almond Coconut Crème Body Wash, Soufflé Body Crème, Hand Crème and Lait d'Amande et de Coco. Kiehl's 'Greatest Hits' Collection - A collection of Kiehl's skin, hair and body products in deluxe sizes. Collection includes Amino Acid Shampoo, Amino Acid Conditioner, Creme de Corps Body Moisturizer, Creme de Corps Soy Milk and Honey Body Polish, Ultimate Strength Hand Salve, Ultra Facial Cream, Midnight Recovery Concentrate. 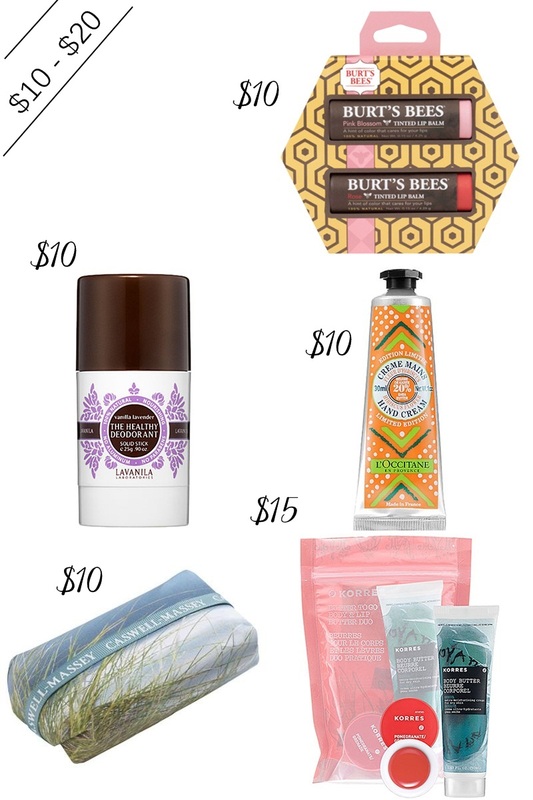 Have you tried any of these Bath and Body products? Disclosure: Some of the products featured in this article were provided by PR for consideration. All opinions are my own. For more information please refer to my Disclosure Policy. I love Burt's Bees and Korres. Korres products make for great presents!